HP Discover HP is still hard at work at the futuristic computing platform it has dubbed the Machine, and staffers from HP Labs were on hand at the HP Discover conference in Las Vegas this week to give an update on its progress. There was even sample hardware on display, which HP Labs' Jaap Suermondt said was "evidence that we're actually making significant progress." Progress doesn't equal product, though, and there's little evidence that the Machine is anywhere close to being marketable. But then, as HP CTO Martin Fink put it in a presentation for the media, HP has always described the Machine as an "end-of-decade project." HP has branded its current fancy servers "Moonshot." Think of the Machine as more of a "Mars-shot" – the R&D required will cost about as much and it has nearly as much chance of success. In case you're not familiar with the core idea, the Machine is a new kind of computing device aimed at addressing the new kinds of problems that arise given the current data explosion. What makes the Machine different from current-generation computers is that it makes memory central, in an architecture that HP is calling memory-driven computing (MDC). Each Machine has a pool of what HP calls "universal memory," and you can attach whatever you want to that memory – including CPU cores, GPUs, network interfaces, specialized processing units, and so on. "When you boot the Machine, you actually boot all of the memory; only when all of the memory is fully booted do you boot the processors," Fink explained. "You can reboot all of the processors and not even impact memory." Another unique aspect of the Machine is that all of the memory is non-volatile, ideally using HP's future-voodoo memristor technology. Fink said he doesn't believe HP will be alone in this; eventually, the whole industry will move toward non-volatile memory technologies. Having that much data in memory allows the Machine to tackle all sorts of problems that are infeasible today, Fink said. But HP would also like to work with software partners to move existing workloads onto the machine – such as IBM's Watson, for example, or even SAP. But the Machine isn't aimed solely at huge, number-crunching workloads. Because non-volatile memory doesn't need to be constantly refreshed like DRAM does, it is inherently needs little energy. That makes it possible to use the Machine architecture for what HP calls "fog computing," where data gathering and analytics can be carried out by small devices on the edge of the network, to avoid the problems inherent in uploading huge amounts of raw data to the cloud. HP Labs researcher Pratyusa Manadhata said HP is also engineering the Machine to be secure from the ground up, with security mechanisms built into everything from the OS all the way down to the hardware itself. For example, he said, certain portions of the memory can be restricted so that they can only be accessed by certain CPU cores. "If the Machine offered absolutely no enhancement to performance for a workload and all it did was accomplish its security goals, that fact alone would make it valuable," Fink opined. The Machine is designed for performance, too. At is core is a fabric based on photonics – data communications using light instead of electricity. Suermondt said HP is already able to push 100GB (that's gigabytes) per second through a single fiber. Is this 'Mars-shot' really feasible? Yet problems remain. The most glaring one is that HP still has not managed to bring its fabled memristor technology to market, meaning the universal non-volatile memory at the core of the Machine's design doesn't really exist yet. What's more, Fink said at the event in Las Vegas that HP is now exploring alternative non-volatile memory technologies for the Machine, including phase change memory and resistive RAM, which suggests that HP is still waiting for a breakthrough that would make memristors feasible. And the trouble with all of these non-volatile memory technologies is that they're prohibitively expensive, particularly at the scale that HP envisions. About the only hope HP has of making the Machine cost effective is if it can manufacture the memory itself, but that hope continues to elude it. Fink said HP plans to have a 320TB prototype version of the Machine available sometime next year. 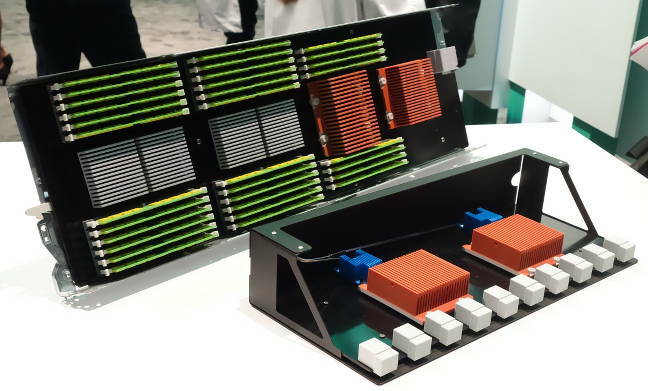 But that version will just be a demo vehicle based on DRAM – "if you don't pull the power, DRAM is non-volatile," Fink quipped – and exactly when it will be available is still an open question. Fink wouldn't commit to having it ready by next year's HP Discover.